Last week, a House Appropriations subcommittee voted to recommend level funding for libraries in FY2018, which would mean roughly $231 million for the Institute of Museum and Library Services (IMLS), $183 million for the Library Services and Technology Act, and $27 million for the Innovative Approaches to Literacy (IAL) program. The vote comes after President Trump in May doubled down on his call to eliminate IMLS and virtually all federal funding for libraries, as well as a host of other vital agencies, including the National Endowments for the Arts and the Humanities. When the first daughter tweeted about applauding librarians last week, she was not met with much praise. As we know, her father has slashed library budgets wherever he could (and doesn't seem to want to read any books). Ivanka: This #NationalLibraryWeek, we honor our libraries and librarians for opening our eyes to the world of knowledge, learning and reading! "Defunding libraries as proposed in your dad's budget hurts hardworking Americans," the nonprofit EveryLibrary tweeted back at Trump, before adding, "Cuts to federal funding for libraries are absolutely unconscionable, cruel, and unnecessary. 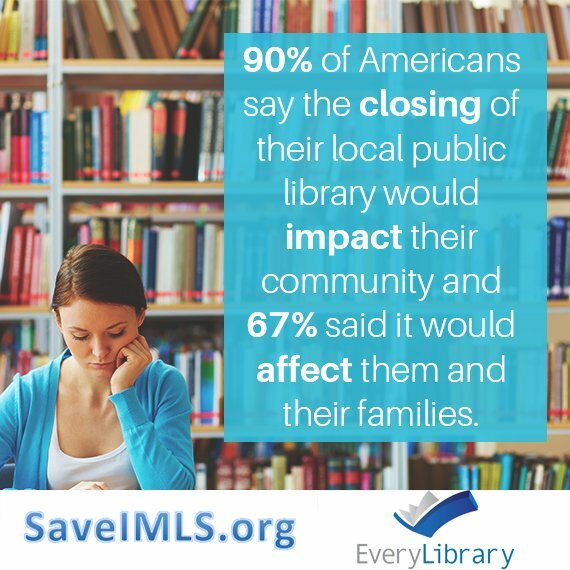 #saveIMLS #library." When you think of Charles and David Koch and their dreams of remaking America into a libertarian paradise, you generally associate them with campaigns to elect rightwing candidates. “The Library of Congress’s decision is blatant capitulation to political correctness — replacing the correct term ‘illegal alien’ with terms that are both factually and legally incorrect,” the letter, obtained by TheBlaze, read. “Simply, it is inappropriate for the Library of Congress to unilaterally replace accurate, legal terms with inaccurate, generalized terms in the name of political correctness,” the letter continued. The Koch Brothers have finally launched their attack on libraries. On Thursday, the Koch Brother's super PAC "Americans for Prosperity" started robocalls against the Plainfield IL library referendum. They have targeted the library for defeat as part of their anti-tax agenda. "Americans for Prosperity" is good at quoting facts that don't exist and slinging mud at the common good. We need your help to answer this Koch funded anti-library smear campaign now, and your help in future to build a defense against their anti-library agenda. moking outside of public libraries in New York may soon be banned. State lawmakers have introduced a bill to add libraries to the restriction put in place in 2012 that prohibits smoking within 100 feet of school entrances or exits. “Today, I am proud to extend that smoke-free protection even further to include the entrances and exits of our state’s libraries,” said Assemblyman Jeffrey Dinowitz, D-Bronx, in a statement. He's sponsoring the bill with Sen. Gustavo Rivera, D-Bronx.